Hermann Prey Interview with Bruce Duffie . . . . . . .
As a society, we are gravitating more and more toward specialization. Whether this is a good thing or a bad thing — or perhaps just a thing — is a topic for discussion at another time. But many aspects of our lives are, indeed, being presented and consumed in a shrinking vista. There are exceptions, but the large, general-merchandise stores have mostly given way to the specialty shop. There have always been large and small food dispensaries with varied menus, and others with single-genre fare, but just coffee??? That was a startling success, though they seem to be offering a wider selection at time moves along. Athletes have always gravitated to one particular sport, with only a few participating in the bi- or tri- or dec-athalon. That is why the winner of the latter is acknowledged as the World's Greatest Athlete. But even there, we now have specialists who mostly (or only) hit or kick or run within their individual game. We now even see punters or place kickers, starting pitchers or relievers, to say nothing of offensive linesmen or defensive players! In my own line of work, broadcast outlets used to be filled with radio and TV stations which ran a variety of programming. The same station would have comedy shows and dramas and even the Philharmonic. But as time progressed, first radio (with the advent of FM) and then TV (with the rise of cable) mostly became niche market outlets. The old joke is more and more true — it’s no longer BROADcasting, but NARROWcasting! In my own case, while I enjoy and present the whole spectrum of Classical Music — from the Medieval and Renaissance ages through today’s living composers, both large ensembles and chamber groups in the instrumental and vocal varieties — I freely admit to having no affinity for jazz or pop, to say nothing of rock or hip-hop or rap, or any of the other forms on today’s version of Your Hit Parade. Turning to vocalism of the Fine Art variety, the Romantic Age ushered in the need for a more heroic singer. Rarely did you find one who would regularly perform Wagner and bel canto. These days, there is a whole sub-culture which presents music solely penned after, roughly, 1950. Serious singers fit into their fach, and rarely venture away from that stone-carved list of roles. And while many do cross over from the opera house to the concert stage and recital platform, few are regarded as Great in any two of those arenas, to say nothing of the rare songbird who is heralded in all three. One such master is Hermann Prey. His operatic repertoire, though certainly an identifiable fach, was highly regarded. He was always in demand for oratorios and cantatas, and he conquered the recital hall as few others have done before or since. In this he was not unique, but his varied abilities placed him in a small, select company. It was my pleasure to hear this man a couple of times in recital, and a privilege to sit down and talk with him in Chicago in the fall of 1985. Here is that conversation . . . . .
Hermann Prey: [Laughs] You know, it is very difficult to explain. It would take hours, if I want to get really into the point — and if I can get into the point in English, since my mother tongue is German. I don’t know. It is very difficult. I cannot explain it in English what you have asked me. In general, I always say to my students I don’t like very much to be a “Mozart singer” or a “Schubert singer” or a “Verdi singer.” A singer must be able to sing everything. As far as I’m concerned, I sing Père Germont in La Traviata the same way vocally as I sing the Winterreise by Franz Schubert. There is no difference for me. BD: Is there any special joy in singing Mozart? HP: Yes, it’s the music. For me, Mozart was always, so far as opera is concerned, the composer. I sang more Mozart in my life than I sang any other composers. I have sung all the Mozart operas for twenty years at the Salzburg Festival, and I made some recordings of it. Mozart was always, so far as opera is concerned, the center of my opera life. BD: Is it especially good for the voice? BD: But you sing both Mozart and Wagner! HP: Yes, but I try to sing not very many Wagner parts. I sing only two, as a matter of fact, until now. I plan that I will do, maybe later, some more. I sang and still sing Wolfram von Eschenbach in Tannhäuser. That was my debut at the Metropolitan Opera in 1960, and I sang it at the Bayreuth Festival as well. Then three years ago I added another part, which really isn’t my part — everybody thought it will not be my part — Beckmesser in Meistersinger. But it helped me, what you asked me before, since I tried to sing this part a little bit in the direction of Mozart. I sing this like a Mozart character, and that came out very well. If you look at the partitura, at the score, then you see it’s written very — how you say? — it’s marvelous to sing, this part! Yes, a fabulous part! It’s the best part in the whole opera for the singer, because you can show everything. You can show brilliance, and you can sing coloraturas, everything. And he should be the best singer in the whole cast because he is the marker. He must know most of all of them. Wagner gave him a Latin name, so he’s Sixtus Beckmesser. Sixtus means that he is an educated man! BD: But is he a better singer than Walther? HP: I would say he knows more about the tabulatura than Walther. Walther knows nothing about it. Walther is just exploding and improvising. He brings something new into this squared family of mastersingers. But this is what makes Beckmesser really angry. Besides that, he is also keen on Eva. BD: So Beckmesser, then, is the best singer in the old style? BD: And Walther is something new? BD: Is it good, then, that singers like René Kollo or Peter Hoffman, who sang rock, also sing Walther? HP: I don’t know! [Both laugh] I did also these excursions in music. I sang many musicals and operettas, but a few years ago I gave them up. We have in German a saying which means, shoemaker stay with your piece of wood. I don’t know anybody who was a good, outstanding classical singer who made a career as a pop singer. Peter did sing rock until two years ago, but I haven’t heard that he is continuing with this direction. Late in his career, Ezio Pinza did it with South Pacific, and Cesare Siepi tried it in Bravo, Giovanni. BD: Are singers today mindful of the great Wagnerian traditions, especially at Bayreuth? HP: I cannot talk very objectively about Bayreuth because I’m a little bit mad at Wolfgang Wagner. In spite of it, I will sing Meistersinger again next year, but I don’t like the policy of the Bayreuth Festival as it is now. BD: The hiring of stage-directors? HP: Yes, and everything. It’s very difficult, you know, because I think Wagner deserves more than what they do. They try too many experiments! If I were the director of the festival, it would not be my policy to hire somebody who has never in his life conducted a Wagner opera before, and just tries out to see if he can do it in Bayreuth. BD: They should get the great Wagner conductors and directors? BD: So Bayreuth should be the pinnacle, then? HP: It should be the end, yes, not a workshop. BD: Let the rest of the world be a workshop? BD: Tell me about the character of Wolfram. HP: Wolfram is a lieder singer, except in the third act when he meets Heinrich again. Then he has really some dramatic lines to sing. But Wolfram sings only three songs and that’s it; three songs like Schubert songs. BD: Is there a line from Schubert to Wagner? HP: I think Wagner knew Schubert very well; I believe that he studied him. Schubert is my favorite composer, I must say, and I’m not objective. [Both laugh]. But some of the lines in his lieder, I feel that Wagner knew them. BD: Knew them and understood them? HP: Yes, but more, it’s Verdi. For instance, the opera Alfonso und Estrella, which was written years before Verdi, sounds like a young Verdi. It is fabulous! BD: Why is that work not more well-known? HP: He was so unlucky in picking the right scripts; the scripts are not very good. I’m just studying for my next season. I have a Schubert festival in Vienna, and we are the fourth year. We will do the opera Adrast. It’s only a torso that’s not completed, but it has beautiful music! I think he was not very clever in picking the right men for making him the script, especially when he was very, very young. So that might be the reason. But there are at least four or five operas which you could play on the stage, and that is what I have in mind with this festival. In twelve years we will do the whole work of Schubert in chronological order — all the chamber music, all the songs, everything. It’s more than one thousand opus including opera and chamber music. This year we have four great Liederabender. It’s the third year, and we are up to 1815. That year was the first year when he had an explosion of lieder composition. He wrote more than a hundred and fifty songs in this year. [Here, Prey picks up a book which listed titles and dates.] For instance, on the 19th of August in 1815, he wrote one, two, three, four, five songs! These included “Der Rattenfänger, Der Schatzgräber, Heidenröslein, Bundeslied, und An den Mond! HP: Great songs! Except Bundeslied, which is not so known, but all of them are highlights! [Laughs] That’s the truth. And you see here? On the 25th of August in 1815, he wrote one, two, three, four, five, six, seven, eight, nine, ten, eleven different songs! Some are quartets, two are for tenor, one for soprano, one for baritone, another one for soprano, and then quartets. And in the same month he wrote the Minuet und Trio for Clavier! Then on the 14th of September, one, two, three, four, five, six songs, some very well-known. I want to show how this man worked. BD: He worked constantly, constantly! HP: Constantly, and very hard! When you imagine that he had only about fifteen years’ time, and he wrote over one thousand opus! HP: Incredible! And there are big things like the Wanderer Fantasie, or operas like Alfonso und Estrella. BD: That’s significant. And you’ll get all of this done then in twelve festivals? HP: In about twelve festivals. Each festival is ten or twelve concerts. This year we have, for instance, Die Bürgschaft, a big ballad by Friedrich Schiller. It takes about eighteen minutes, and last year we had Der Taucher, The Diver, also by Schiller. It was twenty-five minutes. It is a big thing, like an opera, but only for piano and one singer. BD: You’ve recorded some of these songs which have been orchestrated by other people. Is that a mistake to orchestrate them? HP: No, I don’t think so. I did some last week in New York with Zubin Mehta and New York Philharmonic, and I feel it is a great homage by Brahms and Reger to Schubert. [See my inerviews with Zubin Mehta.] Some of the songs come out very well, don’t you think? Some are much better with piano — all of them are better with piano, but you have the possibility to sing Schubert songs in front of an audience which never would come to a lieder recital. You have different audiences. Some of them go only to symphony concerts, and then they suddenly hear a Schubert song. I sang this concert three times to about seven thousand five hundred people. If five hundred come for my next Carnegie recital and say, “We will go and see it. It was very nice,” it was successful! BD: How do you balance your career, opera and concert? HP: I would put it this way. If my year has four quarters, I devote one quarter for lieder recitals, one quarter for opera, one quarter for recordings and television, and one quarter for vacation. But “vacation” is not really a vacation. Vacation is a kind of working vacation, a training camp to prepare new things. I don’t appear in public. I am just learning things for the next year, for the next season because many of those Schubert songs I have never sung in my life. Leonard Hokanson’s my pianist, and we just prepare the next group of songs. I think there are about thirty or forty songs I have to sing, and at least half of them I don’t know; I have to learn them. BD: Do you ever get the working closeness with a conductor that you do with your pianist? HP: Very seldom. After many years of knowing each other, I had a very good relationship to Karl Böhm. We did Mozart in Salzburg. It was not all right the first year or the second, but it came. I got used to him, he got used to me, and the last years I did not watch him at all. Everybody was looking at him like the rabbit at the snake. He was complaining all the time, and I found out that if you don’t look at him, it’s much better. Then he follows you! [Both laugh] I had a very good relationship with him. The advantage of my singing life is that I have both — I can have the recitals and I can have the opera appearances. You have so many possibilities of improbabilities in opera. It can be the stage, it can be the lighting, it can be the staging, or the regisseur. It can be the conductor, it can be the colleague, it can be the chorus or the orchestra, everybody! If you have a recital, you have only one! [Both laugh] Maybe two — you do have the pianist, and the piano. Yesterday we had, not a terrible, but a very difficult piano. It was a kind of a challenge for Leonard. It came out very beautifully, because he was so brilliant, but he had to choke out of this piano everything he could, and he did! BD: So it’s more of a challenge, then? HP: Yes! But sometimes it’s better if you have not such a good piano! BD: You have to work harder? HP: Yes, because [laughs] you don’t tell him! I find if the piano is too smooth and too beautiful and it is so easy to play, that it sometimes is not so challenging as it was yesterday. BD: Do you find the pianist gets a little lazy? HP: No, not lazy, but the whole thing is maybe too smooth, too good! BD: Can recordings be too good, too perfect? HP: I think yes. I make many, and I always try to make like productions. I’m doing now twenty-four hours for Compact Video Disk. This is live, you know; you cannot cut it. You must sing the song, and then either it works or if it doesn’t work. You cannot make pick-ups in these filmings. You can’t edit, as in tapes when you do only the audio. If you do video, you must make the whole take, and that means one song. BD: The whole song? Not a group of songs? HP: No. I used to do many live concerts for recording. Sometimes it’s very dangerous if you have these perfect productions especially of lieders. It’s the same with opera; they are a little bit antiseptic. BD: It loses the spontaneity? BD: Tell me about the character of Figaro. What kind of a man is he? HP: He is a lover, not a revolutionary. He wants to get his girl. BD: Just one girl? Not many girls? HP: He’s a lover, but he loves one girl. He wants Susanna. That’s all the old stories! It’s against his goal, and that makes him angry. HP: I think not very much. In the Trilogy of Beaumarchais, Figaro should be at least ten years older than the Countess. When the Count enters stage in Barber of Seville, he is sixteen years old, and Figaro is about twenty-six to thirty. He is a businessman. He has his own shop, and his own clients. And the Contessa also is very young. Bartolo is her uncle, and he is maybe forty. He cannot be a very old man because he still has her in mind. He thinks, “With my money and being a dottore, I can get this girl.” So Figaro is about thirty, and then comes this young couple! BD: Is Figaro happy to help them get together and outwit the old man? BD: So if Bartolo had gone to Figaro, maybe Bartolo would have wound up with Rosina? HP: No, I think he sticks more to the youth, to the young people. BD: Even if Bartolo was to offer more money? HP: I have an offer to produce Marriage of Figaro, and I have not decided. I have to decide on the 5th of this coming November, and I think about what you’re asking me. So I don’t want to speak so much about it because I have something in mind when I do this production. But I’m not sure if I will do it. If I do, I’ll do something which should show that this couple — Count and Contessa — should be much younger than Susanna and Figaro. The relationship between Susanna and Figaro is, for me, very difficult to bring onstage so that everybody understands it. BD: Would Susanna act like a governess? HP: Yes, something like that. She confides in her. She is not like a mother, not like an aunt, but like the older sister. This is very important in this piece, that there’s a relationship between these two women. They make the whole story. They use Figaro and they use the Count to get to their goal. BD: Are they modern women? BD: Up to date, twentieth century women? BD: Not women’s lib types? HP: No, I don’t think so. BD: In the Mozart opera you’ve sung both Figaro and the Count. BD: Does that pose any problems when you’re doing one or the other? HP: It’s very difficult in counting, especially in the ensembles, to be sure that you don’t come in with the other part! Vocally the Count is better for my voice, but as a character, I liked more to play Figaro. I sang it very late; I started, I think, in ’76, to sing Figaro for the first time onstage. Before this, I sang for sixteen years Count. The Count was my first opera. BD: That’s the logical progression, from the Rossini Figaro to the Mozart Count, rather than from Figaro to Figaro. HP: Yes. I was very lucky. But I always had it in mind. Once in Vienna I sang it one week, Figaro in Barbiere, and Figaro in Marriage of Figaro, and it was very good. BD: Were you able to keep the continuity? HP: Yes, it was very good. BD: I’ve always been disappointed that the third play has not been made into a popular opera. Milhaud has done one, but it has never caught on. HP: That is the opera where the Countess gets a child from Cherubino. BD: In The Marriage of Figaro, should the Countess be aware of what is coming? Should she know what will happen later? HP: She forgives him, yes. That’s what I told you — she wants him back! She wants this man and Susanna wants Figaro. BD: So it all works out in the end? BD: How do we get more people into your concerts? Prey’s Agent (who has been in the room with us): You’re helping with this. HP: Yesterday I was in Atlanta. I think it was the first time ever that somebody sang a Schubert cycle in Atlanta, but I was astonished — it was full! A fabulous audience! Prey’s Agent: That’s even more important — to have a wonderful audience. BD: So are we building a tradition in America of Liederabend? HP: I have tried for thirty years. I came here first in 1952; it was a part of the prize when I still was a student. I was twenty-three then; I was born in ’29, and then I came back in ’56 to sing my first recital in Carnegie Hall. I traveled every year to this country and was in every little spot here. And I was always successful! But, it’s very difficult. Twice I sold out Carnegie Hall. There was no subscription, nothing, just box office. That’s something! I’m proud of that! BD: Were the people coming to see Hermann Prey, or were they coming to hear Schubert? HP: It doesn’t matter. If they come to hear the Schubert cycle, then they want to hear it sung by me. Otherwise they wouldn’t come. They can go to Fisher-Dieskau or they can go to Jessye Norman to hear other Schubert songs. BD: Is there any competition among singers for that kind of thing? HP: The field is very small. If a singer sang a Schubert recital in Atlanta, let’s say, it will be difficult to fill the hall again if two months later another singer comes and sings another Schubert recital. It dumps us out, once the steam is out! HP: This was very nice, very nice. I’m very astonished! I did better than I thought I can do. Prey’s Agent: I am sure you did, because your English is very good. HP: [Directed to the agent] But it depends on him, on his questions, and how he asks me. [Directed to BD] This was very good. I am pleased to speak with you today. 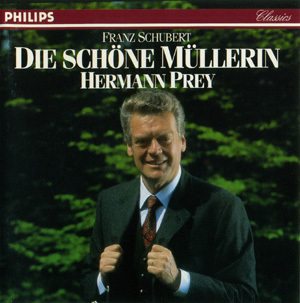 The German baritone, Hermann Prey, grew up during the regime of the National Socialist Party. He was scheduled to be drafted at the age of 15 when the end of the Second World War brought peace and a chance for him to study voice with Gunther Baum and Jaro Prohaska at the Hochschule fur Musik in Berlin. In 1952 he won a contest of Hessischer Rundfunk Frankfurt. 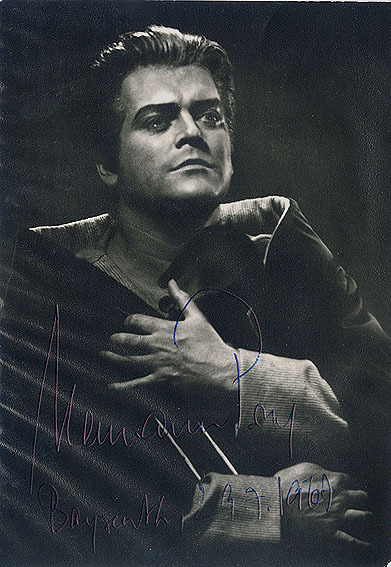 Hermann Prey sang his first Lieder recital in 1952 and the following year he made his operatic debut as Monuccio in Eugen d'Albert's Tiefland at Wiesbaden. Afterwards he joined the Hamburger Staatsoper (1953-1960). Since 1956, he appeared frequently at Berlin and Vienna. In 1959 he debuted at the Bayerische Staatsoper Munich, as well as at the Salzburger Festspiele (as Barbier in Strauss's Die Schweigsame Frau, which was also Fritz Wunderlich's debut at Salzburg), where he often sang Guglielmo and Papageno in subsequent years. 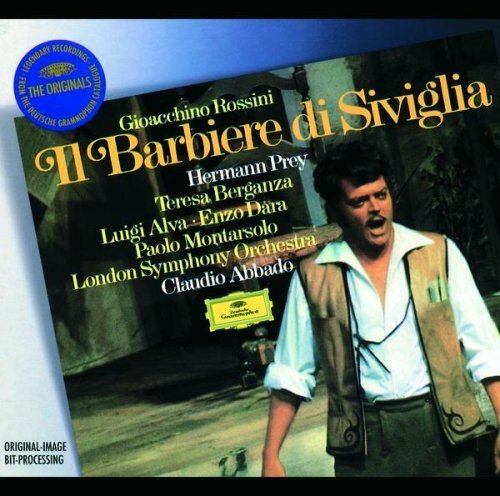 1968 he was the protagonist in the Ponnelle/Claudio Abbado production of Rossini's Barbiere di Siviglia. Between 1960 and 1970, he performed numerous times at the New York Met, where he debuted as Wolfram. In 1987, he again appeared at the Met as Musikmeister in Ariadne auf Naxos. 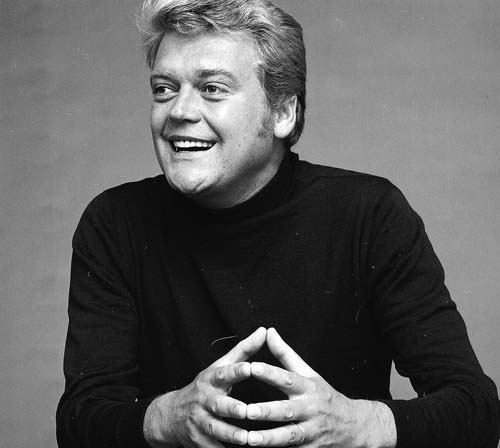 In 1965, he debuted at Bayreuth, again as Wolfram. 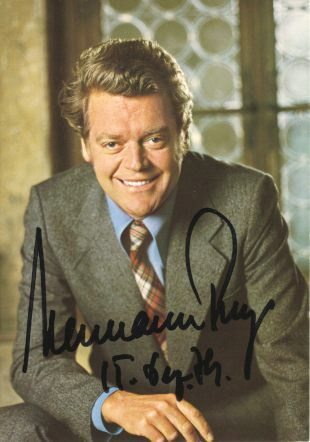 In 1981, he returned to Bayreuth as Beckmesser. In 1973, he debuted at London as Rossini's Barbiere, and subsequently sang Guglielmo, Papageno, Eisenstein there. Although he had sung Verdi parts in his early years, he later concentrated on Mozart and Strauss: Olivier (Hamburg 1957), Harlekin (Munich 1960), Robert Storch (Munich 1960). In 1997, he sang Sprecher at the Salzburger Festspiele. He frequently appeared in the lighter genres of Spieloper and Operetta as well as on TV shows, which made him extraordinary popular in Germany. For all of his fame as an opera star, to many musicians, Hermann Prey is best remembered for his recitals. He gave his first American recital in 1956 and was a regular visitor until the end of his career. He was also a great favorite in Japan. He was especially well known for his interpretations of the songs of Schubert, but he was equally at home with the requirements of many other German and Austrian composers. He was less successful in the few times he moved outside of the German repertoire. 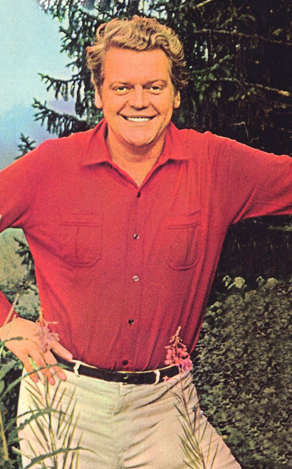 Many listeners compare Prey with Dietrich Fischer-Dieskau as a song interpreter, yet their approach to music making was quite different. Dietrich Fischer-Dieskau gives each word and phrase an individual importance whereas Hermann Prey allows the whole composition to unfold as an entity. Both approaches are valid and have their adherents. On the concert stage, Prey was well known for his singing of the Bach Passions and more especially the Brahms Deutsches Requiem. Hermann Prey's voice was a lyric baritone with great warmth and he had complete control of all dynamic variations. He was able to convey a sense of the comic elements of a song without losing the musical sense of the entire piece. He recorded a multi-volume series for Philips to trace the history of German Lieder from the Minnesingers to songs by Reutter and Blacher. His uncountable recordings range from Lieder to opera and oratorio. In 1982, he began teaching at the Musikhochschule Hamburg in order to pass along what he learned about music interpretation. In 1981, he wrote an autobiography Premierenfieber (which was later also issued in English as First Night Fever). 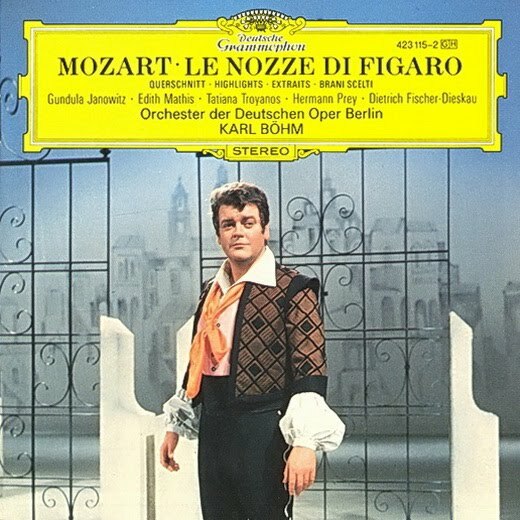 In 1988, he directed a production of Le Nozze di Figaro at Salzburg. He was also one of the founders of a Schubert Festival in Austria. His son Florian has also made a career as a baritone singing some of the same roles for which his father was most famous. 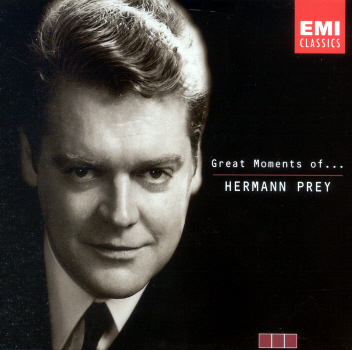 Hermann Prey will always be remembered for the fine musicianship and the beauty of his voice. This interview was recorded in Chicago on October 12, 1985. Portions (along with recordings) were used on WNIB the following year, and again in 1989, 1994, 1998 and 1999. This transcription was made and posted on this website in 2010.